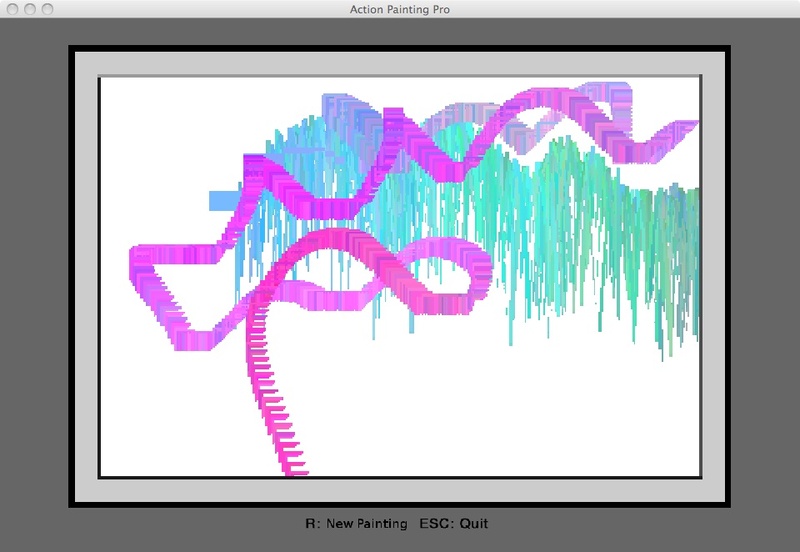 Action Painting Pro (APP) is a small, free game that turns MS Paint into a platformer. Players jump around the screen collecting the different tools which the player then becomes, covering the screen in a mess of colors. Failure here is the inability to contribute further to the painting your character has been farting from their avatar. Falling off the screen presents the player with the finished painting and two options: “New Painting” and “Quit.” There is no game over, so saying that the end of painting is failure might be extreme, but I will get to that in a second. The first thing that I find interesting about APP is that, since we begin with a white canvas, the ultimate failure is a blank, white screen. A white ‘game over’ screen is interesting because it isn’t something that we ever see in mainstream titles. Game over or continue screens are most likely to be black. Every Call of Duty has a continue screen that is a fade to black. Super Mario Land 3D fades to black as well (not sure about other Mario’s). Over the course of just one of those games, how often does one see the relationship between the color black and failure manifested? It’s a little thing, but when it is repeated and reproduced, not only in games, but also in the representation of games in television and film, it has an effect. Black becomes equivalent to failure. This might not happen at a conscious level, but I have to wonder how this has affected people who play games. I realize that this is a small thing, but I still question why I haven’t seen more white screens. Maybe the effect is little to none, but why has black been the default for game over screens for much of the videogame’s existence? Some will probably argue that it was a standard in film and television, and thus just an expectation to fill for audiences. It has become so commonplace that it isn’t even questioned anymore. Black as failure has been repeated over and over and become normalized to the point where we don’t care to even look at it. Maybe it’s a lost battle, but the equivalence of black with death/failure is something that games don’t have to all back into. Yes it’s small, but why continue it other than some odd sense of tradition/normalcy? Now, why did I even think that this was a failure screen? There is no “game over” or “You Died” put on the screen when I stop. 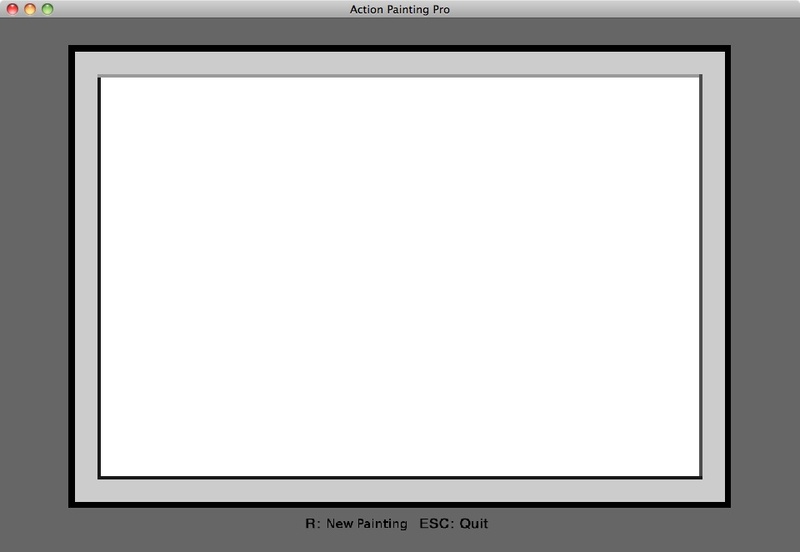 The painting just ends and my production stops. For this we need to understand that there are several ideological/capitalist forces that pressure subjects, particularly within the US, to be continually producing. I’m particularly aware of this as a graduate student because my work infects everything that I touch. This odd sort of Taylorism aims to absolutely maximize the possible productive outputs of a person, not only within the work space, but also in spaces designated for leisure. At its extreme, this ideology forces the idea upon subjects that shows, films, and games are only worthwhile if they can be used within the next piece of writing. APP doesn’t tell me that I’ve failed, but I read failure as the blank screen because of my inability to produce a pretty painting or my inability to fill the play space with colors. I failed my productive drive. 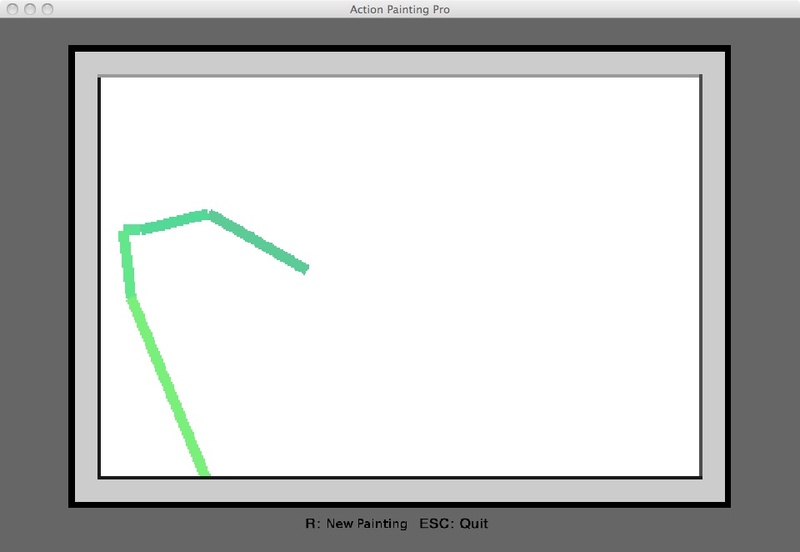 My entire in-game life is directed toward producing a painting. This isn’t unique to APP since output can be linked directly to life in many games. 100 coins in Mario means an extra life and the lack of rings in Sonic leads directly to death. Other games abstract this a bit more, but not much. Assassin’s Creed II allows the player to pick up florins, either from dead people or from pickpocketing, and those can be traded in for health potions or deadlier weapons that can lead to greater efficiency in the collection of florins. However, what is unique is that APP can only be read this way. Here, I am the vehicle of ideology instead of the game. The other games mentioned actively reproduce that productive ideology and place it upon the player. Zolani Stewart talked at Critical Proximity about the necessity of weird games for criticism. Is APP a weird game? I have no idea, but it generated some weird thoughts for such a short/small game. That being said, I often had to read them onto the game. It’s entirely possible that I’ve pulled a Janet Murray on Tetris here! Mainstream titles with heavy narrative bases reproduce ideologies in a very active way that is different from a game like APP. They require a different kind of reading than what was present here. We need to be able to talk about them both though. What we need are different ways of discussing that reproduction to accommodate those kinds of readings and writings. To steal from Barthes, we probably need concepts like readerly and writerly to understand the ideological flows within different games. We need to understand when we are conversing with the text and when we aren’t. Go download APP and read whatever you can onto it because you’ll be doing a lot more listening when you pick up the next Call of Duty. This entry was posted in Criticism, Nick Hanford and tagged Action Painting Pro, capitalism, Free games, game criticism, ideology, Indie games, Janet Murray's Tetris. Bookmark the permalink. In medical anthropology at least, our (meaning “people’s”) attribution of qualities/goodness/morality/expectations to certain colors has recently been re-dubbed the “meaning response.” (The old terminology sometimes referred to this as “the placebo effect” – i.e., why are people afraid to take red pills, but they’re fine with taking blue ones?) I would guess that since black/darkness/lack of light is closely linked to death, it makes “sense,” and is meaningful, to have the end screen of a video game be black. Perhaps white suggests heaven or transcendence? Which I imagine is a less popular theme in the mostly secular gaming world. Interesting read, as always!